Free-to-play, social, mobile, streaming, blah blah blah. Aren’t you sick of hearing about the new platforms that are going to change video games forever? So Electronic Arts is making PC games that it doesn’t expect you to pay $60 for upfront. That’s not revolutionary, that’s just finding a new way for people to pay for games. Social components are more important features than lengthy campaigns? Surprise, people like to play games together! The trends defining the video game market at the end of 2012 are boring. Passé. They’re all about money, not how we play games. You want to know where the real revolution in video games is happening? Princeton University. They’ve made a video game that you can play with fish. A new study published in the Science Journal (via BBC) describes the video game Princeton Universtiy developed to study the habits of bluegill sunfish. Bluegill’s are predators, so researcher Dr. Iain Couzin from the Department of Ecology and Evolutionary Biology and his team developed a game that simulates their food source. How it works: Scientists project a collection of red dots on a translucent screen that the fish can see. If many dots are grouped together, the fish are less likely to attack the dots. For the human researchers, the simulation proved that laser pointers are a hilarious way to mess with fish as well as with cats. It also proved the evolutionary function of finding safety in numbers. The game gave the team a controlled set of parameters it simply couldn’t replicate using the fish’s natural prey. 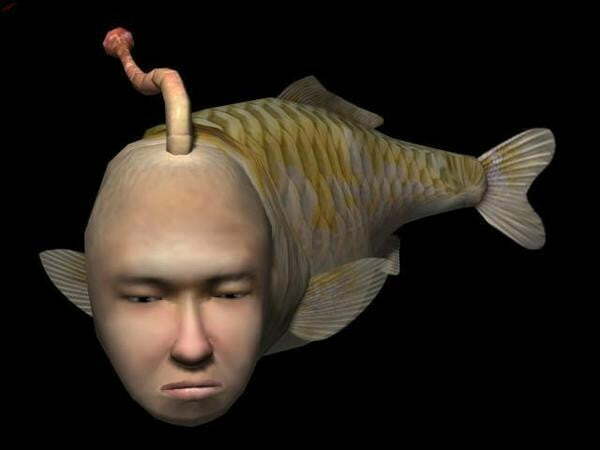 Now all they need to do is figure out a way to put Seaman from Sega’s Seaman series into the tank with the fish to try and teach them English.